Three years ago I had never heard of Mosaic, Sharp or Metropolitan… now they are an integral part of my daily life and I could not have achieved the success I have without the support and opportunity they have all given to me. My story starts with Mosaic (now hosts of the Living Well Partnership in Effra Road, Brixton). After only a short time attending Mosaic they began to involve me in the reception and other duties such as the charitable garden party. After several years unable to work due to my bipolar, Mosaic could see the benefit these experiences were having on my confidence and suggested I take another step forward and start a job via the Transitional Employment Programme, TEP. These posts give people a chance to get back to a working environment. Initially I was apprehensive as I was not sure if it would be a success and if it would be the right working environment for me. However, I was persuaded to give it a try and assured I would have all the support I would need from Mosaic. 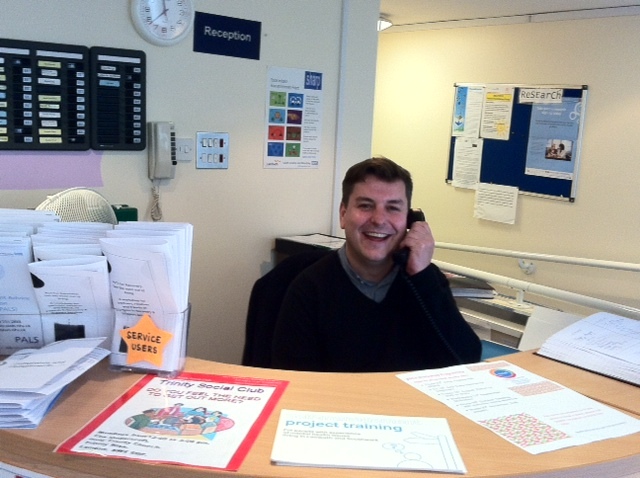 I started working as a receptionist at SHARP, part of the South London and Maudsley NHS Foundation Trust. SHARP stands for Social Inclusion, Hope and Recovery Project. It is a small multidisciplinary team of highly skilled professionals that provide psychological (Cognitive Behavioural Therapy, Family and Motivational Interventions) and social (Social Inclusion, Healthy Living Programme) interventions, which aim to increase social inclusion and facilitate recovery. I had great training from Mosaic support workers and my initial concerns about the job were soon forgotten. Working with people that understand some of the difficulties we have faced in our lives makes it so much easier to conquer the personal anxieties we face when considering entering back in to employment. Before long I was trusted to open the building as part of my morning shift, start up the reception, liaise with the relevant staff member regarding any information and messages received and set up for the requirements of the meeting rooms. Working on reception really helped my confidence and skills grow. • Safety Awareness and Infection Control. • Understanding Personal Safety and Security. • Principles of Infection Prevention. • Health and Safety in the Workplace. SHARP were confident I could develop my training further and offered to sponsor me to study a Diploma in Business and Administration NVQ via Bromley College. The course required me to attend college for one day each month, while continuing my employment at SHARP and carrying out coursework with the support of the TEP. I initially had anxieties about the course but it was not long before I was enjoying this as much as my work at SHARP. In October 2013 I passed the Diploma in Business and Administration NVQ. This was such an important milestone for me, after all those years spent without the confidence to work, I now knew that I was ready to move on from SHARP to new independent employment. In January I started a new position as Project Administrator at Metropolitan. It was incredibly exciting to start my new job and although I miss everyone I worked with at SHARP and the support I had from Mosaic, I move on knowing that I leave behind an opportunity for someone else to benefit from all the amazing experiences and training that was given to me. Metropolitan is a leading provider of integrated housing services, care and support and community regeneration. My remit requires me to give administration support for designated care and support teams. I work within an incredibly supportive team and report directly to Lucas Teague, Missing Link Coordinator. Missing Link is a peer support service which provides support to patients in Lambeth hospital during their time on the ward and as they are discharged from hospital and their road to recovery continues at home. It is incredibly rewarding to be able to offer support to this group of people and give back some of the support that has been given to me. My journey over the past three years has been amazing. I would never have imagined that there is such a high level of support to get people on the road to recovery and set them up for life through work and experience. It is incredibly reassuring to know that there are so many people out there who care about me. Should you be reading my story and considering a TEP or other opportunities to help you move on, I would urge you to give it a go. Hopefully in the future others will have the benefit of reading your success story and be inspired to do the same.